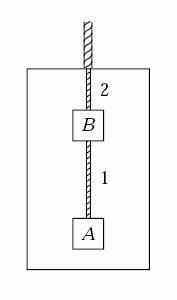 Blocks A and B, each with a mass of 1.0 kg, are hung from the ceiling of an elevator by ropes 1 and 2. What is the force exerted by rope 1 on block A when the elevator is traveling upward at a constant speed of 2.0 m/s? قطعتان صلبتان A و B، لكل منها كتلة مقدارها 1 كيلوغرام، معلقتان في سقف مصعد بواسطة الحبلين 1 و 2، كما في الشكل.